Sign headers help businesses rise above the crowd by adding a unique focal point to standard post and panel signs. In addition to the standard wrought iron sign toppers featured below, Sign Bracket Store also has the ability to manufacture decorative sign headers suited to custom specifications. This allows our clients to create decorative signs that are ideally suited to their project and property. Sign toppers make an easy addition to most any post and panel sign. Simply install along the top rim to create decorative signs that get noticed while exuding professionalism. Scroll work on our wrought iron sign headers is welded to a flat back plate with two holes on each end for simple, durable mounting. Property managers, architects, builders and designers find sign toppers are an easy accent that require little effort while adding maximum visual appeal to post and panel sign displays. Custom variations in size or design are assessed per individual request and quoted as received based on scale and intricacy. To make decorative signs out of a post and panel system, adding wrought iron sign headers is a smart, attractive solution. Sign toppers take usual displays and turn them into memorable markers within a matter of minutes. Products featured in this category are fitted with a flat back plate that has two holes pre-drilled on each end for simple attachment to the top of a post and panel sign. Available online in three standard sizes, sign toppers come in length measurements of 24", 36" and 48" to accommodate a range of popular post and panel systems. For sign headers in measurements not featured here, Sign Bracket Store also has the ability to manufacture to a range of custom sizes. Design is also flexible for clients who have a particular layout in mind. Custom requests are assessed and quoted on a per-project basis with the help of a knowledgeable sign expert. 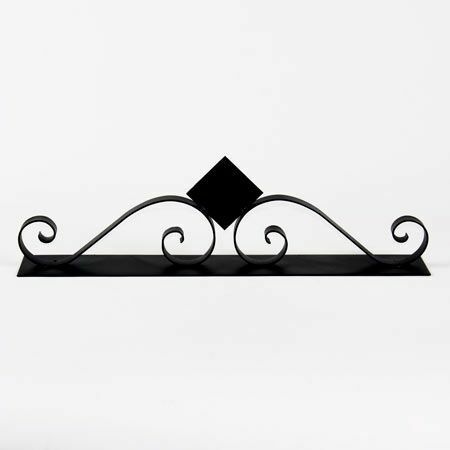 As embellished wrought iron sign headers, products featured below include intricate scroll work that is bent out of quality round bar iron. We finish that off with a black powder coating and hand hammered ends for an elegant look that is also durable in exterior applications. When creating decorative signs, placing sign toppers with post and panel systems is the ideal combination of carefree utility and visual appeal. Durable headers ensure that after affixed, no further maintenance is required. In addition, for signage that moves with a particular trade or project, these sign toppers are easy to uninstall and reinstall as needed. To purchase a full system of decorative signs in one place, Sign Bracket Store is your one-stop destination for post and panel sign systems and accessories. In addition to these wrought iron sign headers, we also offer a range of finials to top sign posts. This is an equally simple and even more affordable alternative to the ornate sign toppers featured above. Whatever the commercial sign project, we can assist with questions and custom requests on an individual basis. Sign Bracket Store makes our team of knowledgeable commercial sign representatives available to our clients toll free.